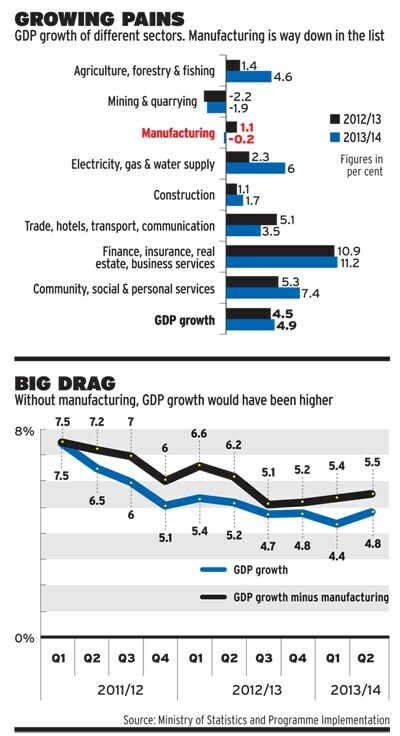 The manufacturing sector is dragging down India's economic growth. 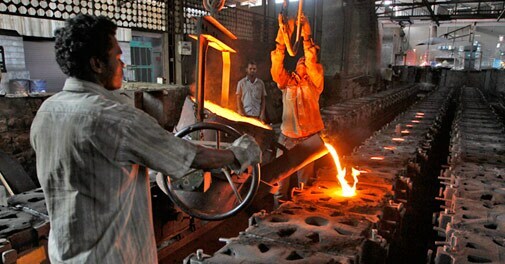 In his nearly hour-long interim budget speech on February 17, Finance Minister P. Chidambaram mentioned manufacturing 15 times. On one occasion, while talking about the state of the economy, he summed up the scenario aptly: "Manufacturing is the Achilles heel of the Indian economy. The deceleration in investment in manufacturing is particularly worrying. Consequently, there is no uptick yet in manufacturing." Advanced estimates released by the Central Statistics Office peg Indias overall GDP growth in 2013/2014 at 4.9 per cent, marginally above 4.5 per cent in 2012/2013. But manufacturing output is seen declining 0.2 per cent in 2013/2014 compared with 1.1 per cent growth the previous year, dragging down the overall economy. It is likely to be the worst year for manufacturing since 1999/2000. The sector has grown at an impressive clip over the years, with growth of around 10 per cent CAGR between 2005 and 2011. The manufacturing sectors lacklustre performance has been driven by industries dependent on domestic demand. The nightmare is spread across many sectors, from metals and automobiles to capital goods and consumer durables. High interest rates capped consumer spending while slow decision-making by the government and land acquisition issues stalled projects and held back capital expenditure in the sector. "More than consumer spending, which is a significant portion, confidence level has an impact in India. That confidence level is low. The captains of industry are all waiting and watching," says S.V. Sukumar, Partner at KPMG India. Production of consumer durables such as refrigerators and washing machines declined in the December quarter from the previous three months, says a Confederation of Indian Industry (CII) spokesperson. Production of machine tools also fell, indicating lower capital expenditure. According to a third party data provider, new investment projects announced in the manufacturing sector were down 70 per cent in 2012/2013 from 2008/2009. The slowdown has other consequences. The attraction of manufacturing is the sort of jobs it creates in other industries, says S. Viswanathan, Managing Director of agro-processing equipment company John Fowler India. "So when there is a slowdown in auto, there is an impact on several ancillary industries. The impact is much wider and the impact on GDP is much deeper," he adds. Viswanathan thinks the solution is simple: government policies need to be clear. "It is an attractive proposition to manufacture in India now. But there needs to be clarity in policies. GST has been talked about for so many years. It is long overdue," he says. Electronics manufacturers have been hit by the Information Technology Agreement (ITA 1) with the World Trade Organization. Foreign companies dumped their electronic products in India and imports replaced domestic production following the agreement signed by India in 1997 which made many electronics products such as notebook computers duty free. These products account for a significant part of electronic consumption in the country and India caters to the demand through large-scale imports. "We have said that as far as ITA 1 is concerned, lets give deemed exports status to the industry. That will bring them on a par with imported products that are flooding the market right now," says P.V.G. Menon, who recently quit as President of the India Electronics and Semiconductor Association.
. "Let's also start implementing the Preferential Market Access policy norms. If we get these two to begin with, Indian industry will get a fighting chance." The policy gives preference to locally made electronics goods in government and private sector procurement. government is finally taking steps to help the sector. The interim budget proposed changes in indirect taxes to boost manufacturing, including cutting the excise duty on some goods in the capital goods and consumer non-durables sectors such as electrical and construction to 10 per cent from 12 per cent. Chidambaram has also proposed reducing the excise duty for the automobile industry as well as restructuring it for mobile handsets to encourage domestic production. The Cabinet Committee on Investments has started fast-tracking stalled projects. Chetan Bijesure, Director and Head of Manufacturing at industry lobby FICCI, says the government has helped resolve issues relating to 137 big-ticket projects entailing an investment of Rs 4.9 lakh crore. "We have been informed that of these 137 projects, 89 projects worth Rs 3.5 lakh crore, belonging to both the private and public sector, are under initial stages of implementation," he says. But these moves will take time to kick in and experts do not see a revival until 2014/2015. "Industrial growth is likely to remain weak for the rest of 2013/14 owing to infrastructure bottlenecks, input constraints, and weak domestic demand. Robust growth in exports may, however, provide some cushion to manufacturing activity," says a KPMG report. * An earlier version suggested P.V.G. Menon was no longer president of the IESA. In fact, though he has resigned, he has not yet demitted office.